Somehow another Mixology Monday has snuck up on me, (thanks to Jeffrey for posting early which alerted me) and once again I am stuck at work with none of my resources, and thereby forced to wing this month’s theme: Variations. Hosted by Jimmy, the theme this month is one that is close to my heart, as, truth be told, almost every recipe that I make is a variation of the original. It just seems that I have a much different palate than many of those great esteemed bartenders of old, and I find myself constantly tweaking the proportions in order to make the resulting libation less sticky and more balanced (or maybe it’s just that the spirits that we are using are so very much different than those available in the late 1800’s). 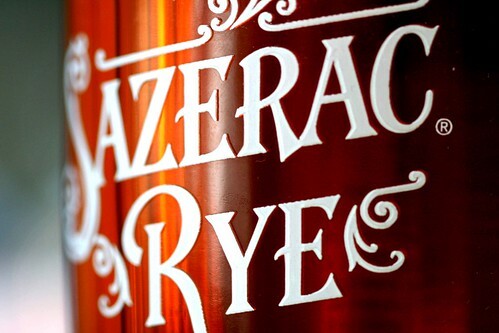 And so there you have it, the evolution of the Sazerac as most of us know it. But did you know that some cocky, young (ok not so young) Canadian by the name of Jamie Boudreau furthered the evolution in 2005 by adding a fourth variation? He was curious to see what would happen if you combined all three versions. And he threw in some Angostura bitters to boot. Now I’m sure that I’m not the only one that has come up with the rather obvious solution of using both cognac and rye, but I will say that I did come up with it by myself, and at one point I’ve even offered up a flight of Sazeracs so that people could taste the evolution for themselves. One may also note that none of my versions are finished with ice in the glass. I’ve never been a fan of watery rye (or cognac for that matter) so I find that omitting the cubes does a great service to the drink (provided that your glass is ice cold). Happy MixMo all, and remember, I came up with all of this at work, with no references, so a date or two may be off by a year or so, but I think that my memory regarding this venerable cocktail will stand fairly solid. So cut me some slack, will ya! ~ by Jamie Boudreau on February 11, 2008. Good choice of cocktail there, Jamie! I’m going to try out your variation when I get home tonight. It’s a good way to make it, and the way that I make it most of the time if people just ask for a sazerac, tho I don’t use angostura. do you know any fantastic cocktails using whiskey from Islay? My colleagues been blogging about Islay whisky and I’m trying my best to compile a list of cocktails for this series.